At a May 14, 2018, Newtown Township Board of Supervisors meeting, a resident claimed that "There is no place [in Newtown] to get a normal sandwich for less than $15" (see here). Actually, there are many places in Newtown where you can get a sandwich/hoagie for under $15. 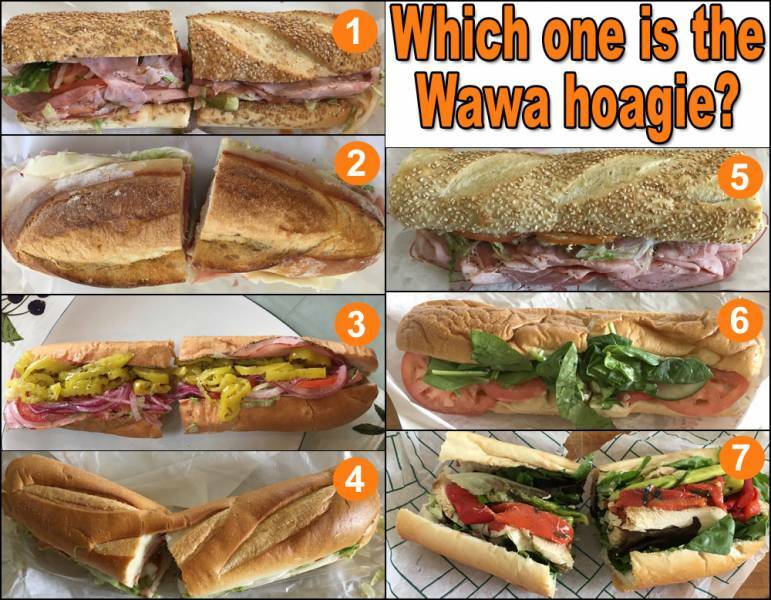 This quiz presented 6 sandwiches for under $15 plus one Wawa hoagie and asked respondents to identify the Wawa hoagie and the highest priced hoagie among a group of seven (see image above). It was a challenge! Over 215 people participated in the quiz. Only 22% of them were able to correctly identify the Wawa hoagie (#6), which is a chicken with spinach classic hoagie that costs about $5.79. The majority (55%) of respondents thought it was #3, which is an Italian hoagie from Shady Brook Farm. It cost about $8. About 13% of respondents thought it was #4, which is an Italian hoagie from Acme and cost $5. To be a fair visual comparison, I agree that I should have a photo of an Italian hoagie from Wawa. So, while attending an EPA meeting in Horsham on 25 July 2018, I purchased a classic Italian hoagie from a local Wawa (see my Instagram post below). During the lunch break today at the EPA PFAS Community Stakeholder meeting in Horsham, I was able to drive about 1 mile down Horsham Road to a Wawa and get this Classic Italian hoagie for $5 and change. It looks OK compared to the chicken hoagie I purchased at the Richboro Wawa. It also tasted OK, but not great. The amount of meat was pretty meager compared to other Italian hoagies I have purchased in Newtown.